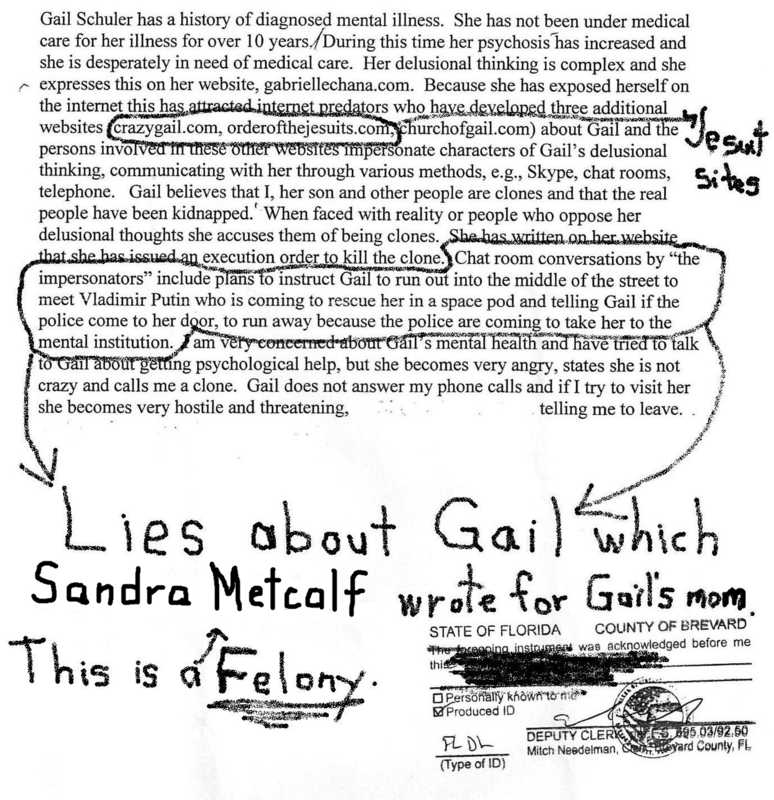 This is a lying statement that Sandra Metcalf, Gail’s evil and jealous sister, wrote for Gail’s mother in July 2012. Sandra extorted Gail’s mother into submitting this statement to a judge, telling Gail’s mother if she did not do so she was not a proper mother to Gail. She made Gail’s mother swear to secrecy that Sandra was the author, but Gail has a taped confession from her mother admitting that Sandra was the author. Gail is still waiting for an apology from her sister regarding this. But rather than apologize, Sandra attacks Gail’s men and has become BFF with evil Jesuit leader Loree McBride in their conspiracies against Gail and her men. It appears that Sandra has even stooped so low as to allow Loree McBride to threaten the life of Gail’s mother now and to cooperate with Loree in trying to make it appear the fault of Gail or her men, that Loree’s germ bombs may have sickened Gail’s mother to a near-death state.